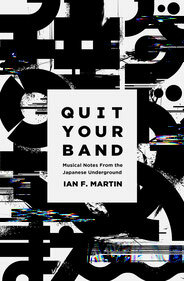 When writing Quit Your Band! I made a conscious decision that the book wasn't going to be a guide to the music itself so much as a book about the world musicians inhabit and the background against which their music exists. Under this structure, the artists I talk about really function as examples for broader points I want to make about trends in music culture or aspects of how the scene’s infrastructure work, and they fall into two main categories. Firstly, there are the artists I encountered in the live venues of Tokyo and beyond as I navigated my own path through the music scene. This would include the bands I have released myself through Call And Response Records, the wider pool of artists I book my events from and the even broader tapestry of artists who make up that world. Basically no one knows who any of these bands are, and most people don’t really want to. Secondly, there are the artists mentioned in the book’s second part, where I discuss the historical background of Japanese pop and rock music. This section deals with mainstream and underground music in parallel, trying to note some of their key areas of intersection, and mentioning some key acts from the immediate postwar period through to the year 2001, when I first arrived in Japan. A few people have suggested that as an accompaniment to this blizzard of band names, I might put together a playlist of some kind, and I’ve put off doing this for a long time — partly through being busy with other things, but also through embarrassment at the prospect of going through and reading the book again. Another problem to overcome was how to reconcile those two threads, each featuring artists of very different levels of significance, without seeming like I was dishonestly trying to exaggerate the historical significance of bands who are really only important to me and my little world. Anyway, here’s the first playlist, covering the history of pop and rock. It’s broadly chronological, but broken up by themes, which often overlap. I’ll explain the structure in the track list below. 34. Nih Nightmare - G.I.S.M. I'm very curious your thoughts on fishmans. Inspirational to all the post 80s Japanese musicians I know. I thought about whether to include them or not (or someone like Sunny Day Service, who seem to have been the other big Shimokitazawa band of that era) and I suppose the only reason I didn't is just because I didn't, really. They do get a mention in the book, but they're just one of a number of important bands (like RC Succession or The Spiders or whatever) that I omitted from the playlist because I decided to arbitrarily draw the line somewhere. No reason, basically.